Growing Vegetables - My Vision Comes Alive! The idea of growing vegetables has been in my mind for some years, but doubted my ability to grow successful vegetables without using chemicals on them, however with the prompting of my husband I finally began forming my vegetable garden. I thought about my plan a great deal. I researched online for ideas and how to create my vegetable garden. First I needed to keep out the grass as I hate to constantly fight with invading grass runners. I measured and pegged out an area 7.5 mtrs square. I then dug down about a 30cm deep trench right around and bashed in seven 8ft star pickets at intervals and over the next few weeks, I made a concrete border to keep the grass out of my growing vegetables. The grass within the square I sprayed several times with weed killer (it was quite resilient!). My first thought was to use treated pine poles for the fence, but I read that the poison can seep into the soil and be absorbed by your vegetable plants! I couldn't use untreated wood as we have a bad termite problem in our area. I bought a 6ft gate and metal gate poles which I also erected before the concreting. 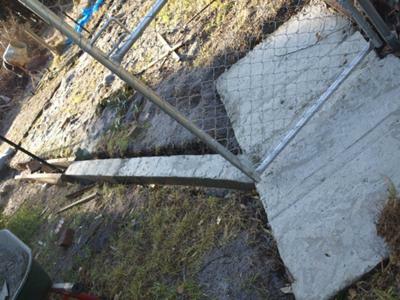 Under the gate I made a concrete slab to ensure the gate would be clear of grass and dirt to keep it opening easily. I then fenced off the perimeter with small holed bird? chicken? wire to keep out dogs and livestock. Now my perimeter was complete I thought long and hard about the layout of my vegetable beds. I'd decided on raised vegetable beds, but I didn't want them to be all square and formal. I like a natural look, so I did not want to use unnatural materials either. I used cardboard as my base for the beds where I would be growing vegetables, which I covered in pea hay. I'd have preferred to use lucerne hay (no weeds), but due to drought the price of it was too high. I covered the hay with soil - bags of soil mix from my local garden shop... they loved me! I spent a fortune on the stuff... some bags of soil conditioner mixed with bags of potting mix. As a border for my beds I chose granite rocks. They are natural and form a great border. I found them easy to obtain free from the classifieds in the paper. I made the beds not too wide, so I could work them with relative ease and I made them nice curved shapes. 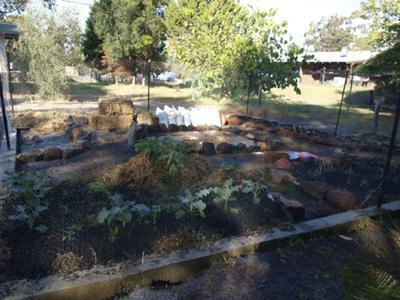 The vegetable growing beds I situated around the outside and in the centre of my garden I made two beds, one raised with a frog pond in as I read frogs can help with insect pest control and one lower bed adjoining in which I placed potted herbs. I decided on pots, as some herbs can spread out of hand. I arranged my vegetable seeds and seedlings in the raised vegetable beds according to compatibility with each other and also planted French Marigolds and Sage, which are both supposed to be beneficial in bug control. 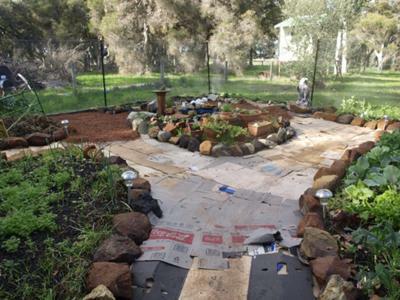 The last part of my garden was to make a pathway... again I thought hard about what material to use and finally decided on cracked pea gravel, as it is attractive, not so expensive as other stones and being cracked is less prone to being slipped on. I placed cardboard down as a base, to deter weeds and I built up a ramp from my gate slab which also serves as retainer for the gravel. I am happy that any time I want to change the layout I can, as nothing within the boundary of the garden is permanently fixed in place. Lastly I added a couple of garden ornaments and a couple of wrought iron chairs to make it more inviting. With help from this site and others I have learned how to best take care of my growing vegetables and have already been reaping the benefits of producing fresh, healthy vegetables with the satisfaction and peace of mind of knowing there are no pesticides or chemical fertilizers used on them. I go around several times a week and squish the pests and have learned which bugs to kill and which to leave alone. I fertilize my crop with seaweed fertilizer once a fortnight(Seasol) and you can just about watch the plants grow as you water them! Comments for Growing Vegetables - My Vision Comes Alive! All vegetables really need is love and good soil. I have always found that if you have those two you will have a plentiful harvest. If you really want huge organic vegetables you will need to look into Aquaponic Gardening. It consist of a symbiotic relationship between fish and your plants. I put such an effort into making this garden to give me more incentive to make it work. Even now I am nervous of my abilities to be a successful organic vegetable grower..
Webmaster(Laurence): Great job!... 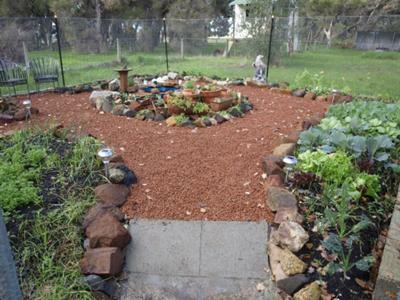 do a chicken pen anyway Jill - composted chicken manure is excellent for your masterpiece! What a commitment and what a result. Your dedication to your project Jill is inspirational - thanks for sharing it with us. I hope in the future you will post some updates in the comments section or even make a new web page like this with updated photos. All the best for your future vegetable growing exploits. PS... yes definitely put netting over, those butterfly catterpillars can destroy plants in a very short period of time. I have my brassicas in a netted area with no problems - so far :0).